At least six passages (eight if parallel passages are included) specifically warn believes against date-setting. Yet down through church history there has been an amazing amount of date-setting. About every two years there is usually someone who makes headlines proclaiming that they know the date of the Second Coming or the Rapture. 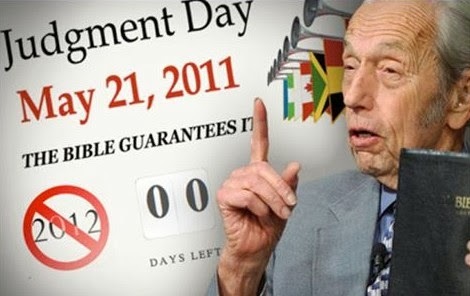 The most recent incident involved the late Harold Camping. Interestingly, Camping comes from an amillennial, covenant theology framework. Many may be surprised that there is actually less date-setting today than there was 100 to 300 years ago. This is because in previous times so many prophecy teachers held to the historicist interpretive approach as opposed to the futurist systems that dominate the scene today. However, there are still some prominent personalities who engage in the biblically forbidden practice of date-setting. Matthew 24:36—"But of that day and hour no one knows, not even the angels of heaven, nor the Son, but the Father alone. Mark 13:32 is an exact parallel. Matthew 24:42—"Therefore be on the alert, for you do not know which day your Lord is coming. Matthew 24:44—"For this reason you be ready too; for the Son of Man is coming at an hour when you do not think He will. Matthew 25:13—"Be on the alert then, for you do not know the day nor the hour. Mark 13:33-37 is a parallel passage. 1 Thessalonians 5:1-2—Now as to the times and the epochs, brethren, you have no need of anything to be written to you. For you yourselves know full well that the day of the Lord will come just like a thief in the night. These passages are absolute prohibitions against date-setting. They do not teach that it was impossible to know the date in the early church, but in the last days some would come to know it. They do not say that no one knows the day or the hour, except those who are able to figure it out through some scheme. No! The date of Christ's coming is a matter of God's revelation and He has chosen not to reveal it even to Christ in His humanity during His first advent (Mt. 24:36). The Bible teaches that God's Word is sufficient for everything needed to live a life pleasing unto Christ (2 Tim. 3:16-17; 2 Pet. 1:3-4). This means that if something is not revealed for us in the Bible, then it is not needed to accomplish God's plan for our lives. The date of Christ's return is not stated in the Bible, therefore, in spite of what some may say, knowing it is not important for living a godly life. The Lord told Israel "The secret things belong to the Lord our God, but the things revealed belong to us and to our sons forever, that we may observe all the words of this law" (Deut. 29:29). The date of Christ's coming has not been revealed, thus it is a secret belonging only to God. Some believe that there are passages in the Bible which teach that believers will be able to know the date of Christ's return. I will examine some of these passages to show how those who advocate date-setting have misused various passages in their attempts to legitimize date-setting. The Bible does not contain internal contradictions. It is wrong to think that on the one hand Scripture says "no man can know," but then on the other hand that some will be able to figure it out. Luke 21:28—"But when these things begin to take place, straighten up and lift up your heads, because your redemption is drawing near." Some have taught that this passage implies a license to date-set. However, important contextual indicators include the fact that it refers to Jewish believers during the future seven-year tribulation, who right before the Second Coming are told to watch, not date-set, as they endure the final period of severe persecution. This does not relate to date-setting but is a general command to watch for the unknown time of the Lord's return. Hebrews 10:25b—"but encouraging one another; and all the more, as you see the day drawing near." Some teach that this implies that believers are able to see or know that "the day" (i.e., the Second Coming) is drawing near. While some do interpret "the day" as a reference to the Second Coming, I think that the immediate context and the context of the book of Hebrews is one that is a warning to Jewish believers before the A.D. 70 destruction of Jerusalem and the Temple not to return (i.e., apostatize) to Judaism, since the immediate future only contained wrath for those Jews who reject Jesus as their Messiah. Therefore, "the day" is not a reference to the Second Coming, instead it refers to Jerusalem’s destruction by the Romans in A.D. 70. 1 Thessalonians 5:4—"But you, brethren , are not in darkness, that the day should overtake you like a thief." It has been taught from this passage that believers would have to know the timing of "the day" (i.e., "the day of the Lord," see 5:2) in order to not be overtaken by it. This date-setting interpretation attaches the wrong sense to Paul's teaching. Paul is saying that they will not be overtaken because they are prepared by virtue of the fact that they are believers. All believers will be taken care of by the Lord (I believe through the Pre-Trib Rapture) so that unlike the unbeliever who will be unprepared and caught off guard, the believer is prepared. Israel's Feast Cycle—The Bible teaches a cycle of seven feasts which Israel was to celebrate yearly. The seven feasts are Passover, Unleavened Bread, Firstfruits, Feast of Weeks, Trumpets, Day of Atonement, and Tabernacles. The first four feasts are celebrated in Spring, while the remaining three are commemorated in the Fall. A common interpretation concludes that the feasts also are prophetic of the career of the Messiah. The Spring cycle is said to have been fulfilled by Christ at His first coming, while the Fall cycle will be fulfilled in the future through events surrounding the Second Coming. Up to this point, I have no problem with this scheme. However, I do have a problem with those who teach that the fifth feast (Trumpets) is a reference to the Rapture. Since Rosh HaShannah (Hebrew for Feast of Trumpets) is yearly celebrated on Tishri 1 according to the Hebrew calendar (this day usually falls in September according to our contemporary calendar), and it is argued that trumpets are related to the Rapture (1 Cor. 15:52), therefore, the Rapture will occur on Tishri 1 as the Spring cycle begins to be fulfilled. This scheme argues that if the year of the Rapture can be determined, then we would know that it would occur in the fall of the year. It seems that many of the more recent and popular date-setting schemes have implemented Israel's feast cycle in some way. There is one major problem with this approach that disqualifies any use of it for date-setting. Israel's feasts relate to Israel and Israel alone. True, the fulfillment of Israel's feasts relate to salvation for all mankind, but the precise fulfillment relates exclusively to national Israel. The Rapture is a new event related only to the church and thus could not have been predicted through Old Testament revelation such as Israel's feast. Thus, any use of the feasts of Israel in an attempt to date-set is invalid. Since the Bible prohibits date-setting, what does it teach? Many of the same passages which prohibit date-setting, at the same time instruct us what to do until the Lord returns. For example, Matthew 24:42 not only warns "for you do not know which day your Lord is coming," but also admonishes believers to "be on the alert." Matthew 24:44 tells us to "be ready" because "the Son of Man is coming at an hour when you do not think He will." Also, Matthew 25:13 admonishes us to "be on the alert then, for you do not know the day nor the hour." The alert to which believers are called is not to date-setting, but one of looking for the Savior, since we do not know when He will return. We are to be alert, in contrast to unbelievers who are pictured as sleeping in regard to the things of God. We are to be alert for the purpose of godly living until the Lord does return because we are in the dark night of this current evil age, which requires an active alertness toward evil. If the church knew the day or the hour of the Rapture then imminence, the posture Christians have in relation to the Rapture, would be destroyed. Biblical imminence teaches that Christ can, but does not have to, come at any moment. It also means that there are no signs which have to be fulfilled in order for the Rapture to occur. Thus, Christ could literally come today, or this hour or moment. Thus, date-setting destroys imminence. How? If someone taught that the Rapture will happen on September 22, 1995, then it would mean that Christ could not come before that time. This would mean that the Rapture could not be imminent, since Christ could not come today if we knew the Rapture would occur on a specific date. Since imminence is often related to commands to holy living, date-setting would also have a negative impact upon ethics. While date-setting is prohibited in God's Word, I believe that it is valid to realize that God is setting the stage for His great end-time program. What does that mean? As we stated in a previous issue, the Rapture is a signless event, thus it is impossible to identify any signs that indicate the nearness of the Rapture. This is why all attempts to date the Rapture have had to wrongly resort to an application of passages relating to God's plan for Israel to the church. An example of this misuse would be those who say Israel's feasts (i.e., Rosh HaShannah) relate to dating the Rapture as noted above. However, since the Bible outlines a clear scenario of players, events and nations involved in the end-time tribulation, we can see God's preparation for the final seven-years of Daniel's seventy weeks for Israel.